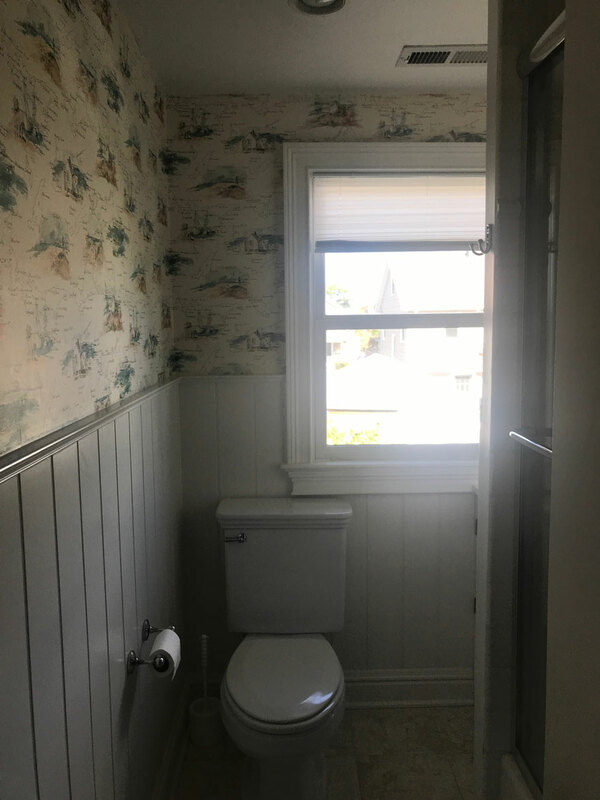 When we first moved into our new (old) house the upstairs hall bath had “coastal” wallpaper, a terrible window blind, and beige tile. Not exactly what we would choose, but it did have one redeeming quality: wainscoting below the wallpaper. 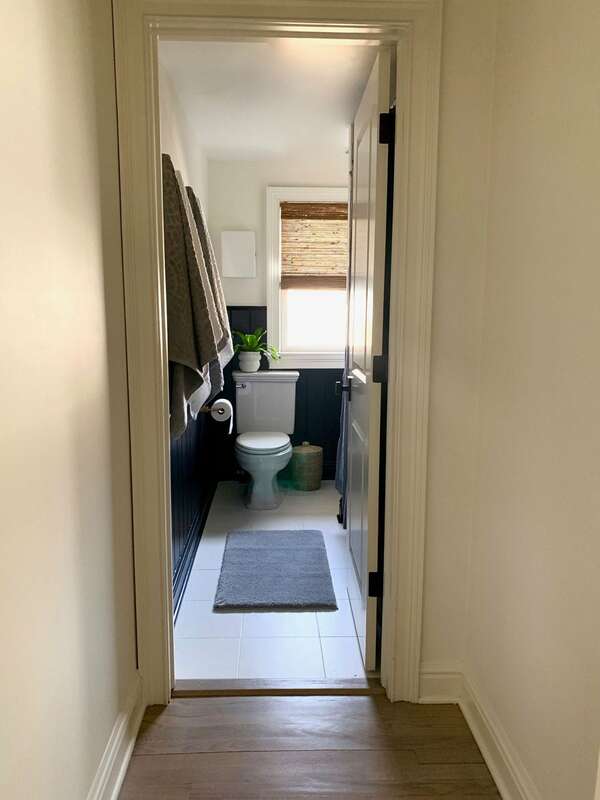 While we worked on other projects in the house, we kept looking at this bathroom and thinking it’s really not that bad and it’s nothing paint couldn’t fix. After the success we had painting the awful tile in our laundry room, we decided to try painting the bathroom tile white *(see below for more detail on painting tile). The result is a more modern look that really brightened up the small space. 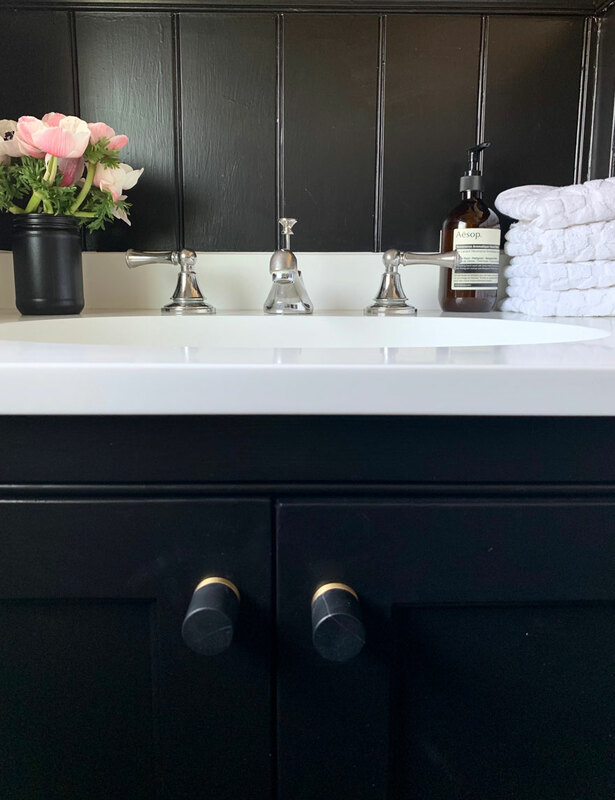 We painted the wainscoting black and then decided the vanity would look so much better in black. As with all projects big and small, one project leads to another. It just made sense to keep the vanity for storage…although, I really wanted this sink. 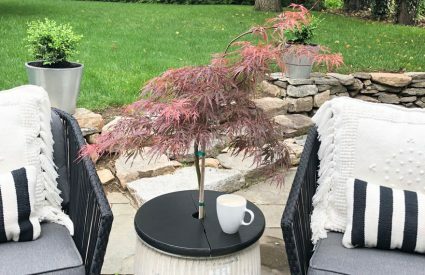 By the time it was painted black and new hardware added, we were completely happy and saved some money in the process. And living in a house that’s almost 100 years old, there will be more projects where that money can be spent. I adore this pressed print from FINN & CO. American Beauty. You can order your here! Garnet Hill generously provided beautiful organic-cotton sculpted towels in titanium and white. I love the texture and pattern and they feel so luxurious. 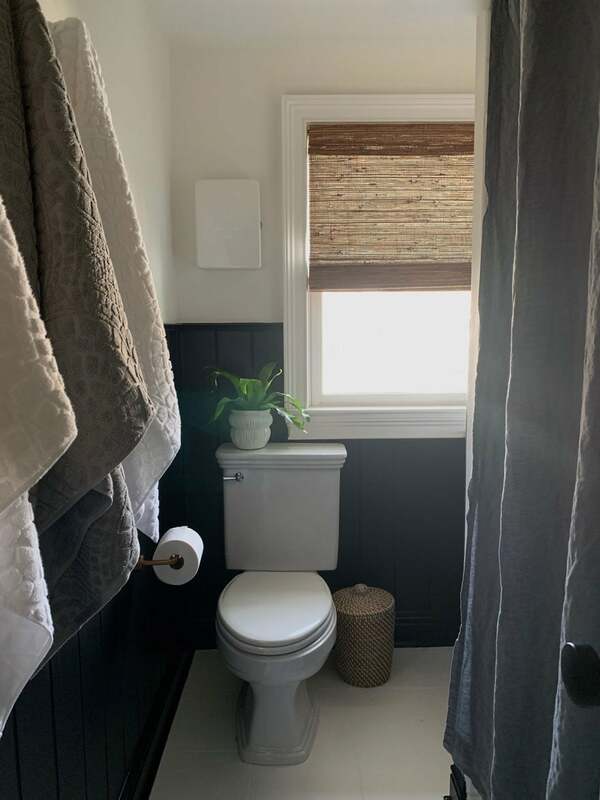 We are also using the relaxed-linen shower curtain in steel gray and plush microfiber bath rug in whisper gray that I love on the white tile. 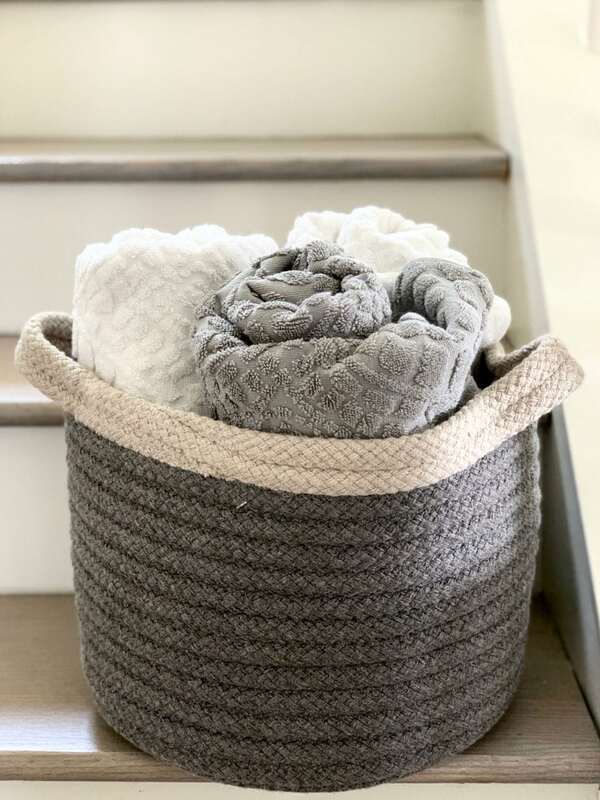 Extra towels are stored in this gorgeous braided storage basket. The baskets are made with Sunbrella acrylic so they can be used indoors and out. (I can see this basket making its way out onto the porch this summer)! Keep reading for the Garnet Hill giveaway at the bottom of the post. Garnet Hill is my go to for luxurious bed linens. We have their signature flannel on our bed currently, but will be switching over to linen for for the late spring and summer months. My kids’ beds (that substitute for guest beds when they are not home) both have GH gorgeous linen sheets and every time someone stays with us…they rave about the bed linens. Garnet Hill signature linen and flannel sheets are so beautiful and feel way more expensive than they are. You can see Patrick’s here and Madeline’s here. *To paint the floors, we cleaned them very well and let them dry. The tile seemed to be porous,(not shiny) so we did not rough them up with sand paper first like some people advise before painting. We applied three coats of Behr concrete and garage floor paint, one part epoxy satin using a foam roller for the smoothest finish. We then used two coats of Annie Sloan Chalk Paint® lacquer like we used on the laundry room tile. We think it’s the lacquer that makes it durable. Our laundry room/mud room has shown no wear even through the winter months. Garnet Hill will give one lucky reader a set of two organic-cotton sculpted bath towels, hand towels and face cloths in their choice of color. Choose from aviary blue, oatmeal, rosa, titanium or white. Leave a comment here and for an extra chance to win, leave a comment on my instagram. You must be following both most_lovely_things and garnethillpics to be eligible to win. Giveaway ends Tuesday, April 2nd at 5pm EST. This post is made possible in product trade by Garnet Hill. All words and opinions are my own. Thank you for supporting the brands that help keep Most Lovely Things going with fresh content. Tiffany, then you wouldn’t have to update for another 20 years! GH products are so well made, they last for years. Garnet Hill has such beautiful things. And your makeover is so lovely. Crisp. Happy. Love the details. Thanks Erin! We love everything from GH…sheets, towels and my favorite linen tunics! What a great refresh! It’s amazing how much paint can change the entire look of the room. I love the black and white and the new hardware. Thanks! We absolutely love it! I can’t wait for my kids to come home to see it! Makeover bathroom is clean and classy! I love the print and how you added a touch of pink…….. Anything from Garnet Hill, is welcomed in my home. Thanks Lynne! I know….anything from GH! It’s all wondeful! Love Garnet Hill! All their products and clothes are so classy. I agree! 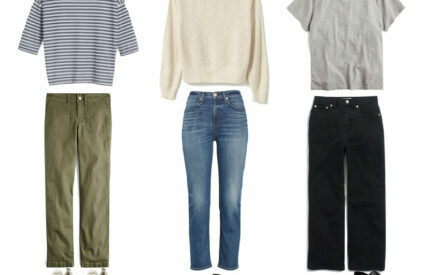 We love the sheets, towels and some of my favorite clothing pieces are GH! Where are the blinds from? Love ’em! Thanks! They are from Blinds to Go. That’s the sweetest thing to say…and yes, these GH towels are super absorbent! Paint is EVERYTHING and I love the texture of the towels! This looks amazing! And perfect timing as we’re getting ready to “refresh” a bathroom in our 90 yo house. I was just skimming through your old posts for painting tile so this timing really is so helpful! Thank you, as always! 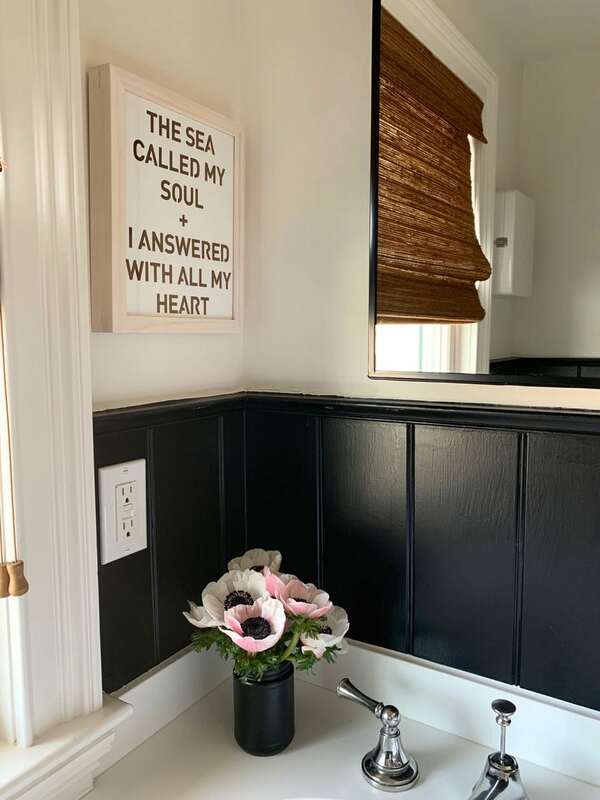 Love your bathroom update! I’m dying to paint a room black in my house. What a transformation! I love your paint color selection and when the sea calls………..I answer with all my heart too! That cabinet hardware is spectacular. I would LOVE to win some GH towels! Beautiful transformation! Love everything you did, especially the Garnet Hill towels. Beautiful towels! Thanks for the opportunity! The bathroom looks amazing and those towels are beautiful! What a great face lift and having nice towels is really the icing on the cake! It looks great! I need to remodel my bathrooms – even if it’s just a fresh coat of paint. I would choose titanium towels if I won. You won! Just sent you an email! Love this transformation, I think I’m going to now paint my daughters vanity black! I am completely in awe with what you’ve done in such a short amount of time in your home!! Love this bathroom and the towels look so luxurious! What a difference, Annie. I would love to win the Garnet Hill towels. If they are anything like the pjs I have from them, I know I will love them! 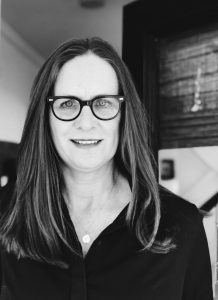 Love your new transformation! Paint is everything .. as are new towels 😉 ! I love your home! 💜💜So talented. 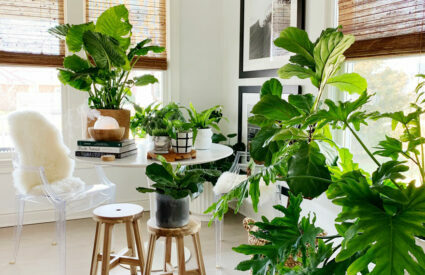 Great inspiration for my own home. Bathroom looks amazing! Black and white is such a classic look. 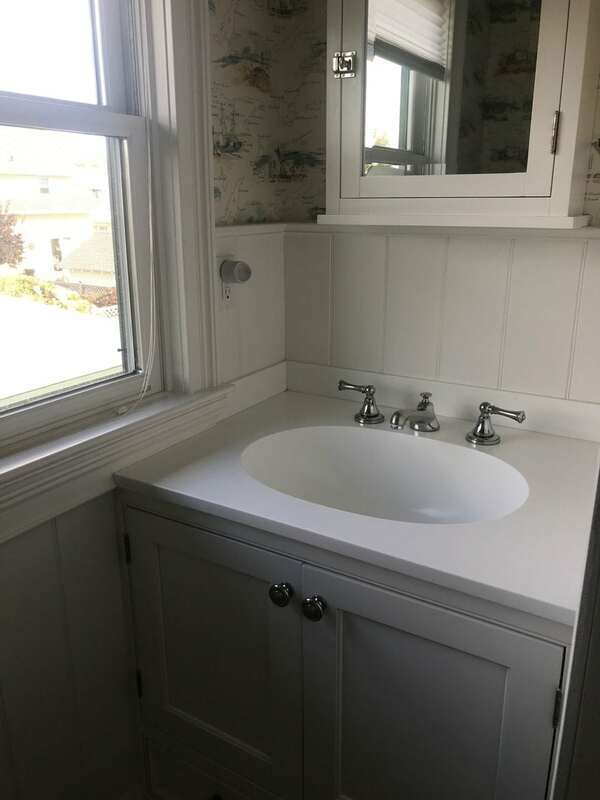 What a beautiful and low budget transformation of what was a pretty plain bathroom. I love the texture of the Garnet Hill sculptured towels. That Oatmeal color would go beautifully in our guest bathroom. I bought GH sheets and duvet covers for my sons when they were little. The sheets held up until they “outgrew” the dragons and wizard print; really quality product. I’ve loved Garnet Hill for years! Gorgeous remodel. Thanks for the tips on (and experience with) painting tiles. Would love to show off Garnet Hill towels in our Hall bathroom. Lots of use there for neighborhood events! Your project looks fantastic. And you can’t go wrong with Garnet Hill! This is making me think we not only *can* update our Hall bathroom, but that we HAVE TO! New towels would go a long way!!!! I love the before and after! Renovations are happening at my house as well, so thisnis exactly what I needed to see. Sometimes simple is best! What a great transformation!! One of these days I’ll paint our hall bath black. I will check Garner Hill ,I am not familiar with them. Love this giveaway!! Garnet Hill towels would look great in any bathroom!! The towels are beautiful and your bathroom is lovely! I have the Garnet Hill pick stitch quilt and absolutely love it! It was my first purchase from them and have since ordered their linen pillow shams as well. Both are just wonderful to the touch and I couldn’t be happier. Thanks for this opportunity to try their towels as well. I’m in love with your bathroom updates. So much inspiration! Love this bathroom and Garnet Hill! I use to get there CATALOG NOT ANYMORE! I just may come for a sleep over to try the sheets OUT! I agree that I could use a towel refresh around here. I have had some for a really long time! Garnet Hill is always great quality.